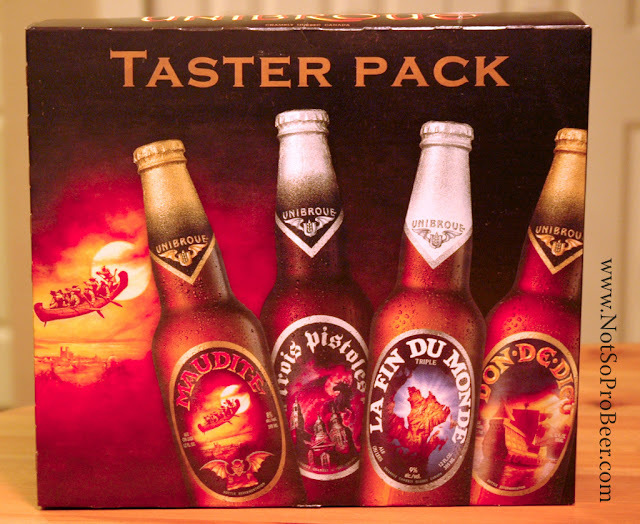 The Not So Professional Beer Blog: Trader Joe's $7.99 Unibroue Sampler Pack!! The funny thing is, I suggested this trip. My ulterior motive was to check out their beer selection. While not huge, they have good deals and some unusual offerings, which include private label beers (some rumored to be made by a GREAT craft brewer). Anyway, I was rewarded for my curiousity. Trader Joe's is selling a 4 bottle taster pack of Unibroue beers. Unibroue is from Chambly, Quebec (Canada) and they make Trappist Monk inspired brews. I have not tasted their beers, but they are rated highly by Beer Advocate. I picked up a pack and look forward to tasting these. If you want to buy this sampler pack, don't wait too long. I expect supplies are limited. If you end up buying this on my recommendation, please let me know what you think! For more on six-pack equivalent (SPE) pricing, please check out It's Pub Night's online calculator. 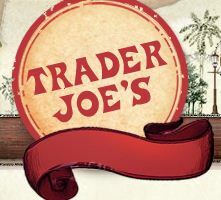 ﻿Full Disclosure: While this is a shameless plug for Trader Joe's and Unibroue, I receive absolutely no free beer or compensation for this post. This is simply a great deal that I wanted to share with my readers. Enjoy! The best part is that coming up to Christmas, there's a Trader Joe's labeled trippel that is brewed by Unibroue. it is delicious. I believe it normally runs about $7 (in Illinois). I never was a fan of Belgian style beers, which seems sacreligious, but I thought I would take advantage of this good price at TJ and try again. Still not a fan. I found these beers to be sour and a little "skunky" as well as too carbonated. Maybe it's the bottle fermentation, I'm not sure. Several beer media sources give these beer great ratings. I'm missing something. Thanks for the tip Anon, if I like these, I'll be sure to check out the trippel next winter. Mark, most people I know tend not to like Belgians as well. I'm on the fence. I'm collecting a few different varieties and plan to start a new series on Belgians in a few weeks. I don't think you missed anything. You tasted what you tasted! One issue with TJ's is that they sell their beer off of a warm shelf. This could contribute to off flavors. My two cents: I was amazed to find the Unibroue "Sampler Pack" at my local Trader Joe's in NYC. I jumped on it like white on rice. In fact I invited a friend over to do a "flight tasting of the four beers. I've got to disagree with the comments so far. I "discovered" Unibroue beers visiting Montreal a few years ago. I think Unibroue are one of the best commercial brewers out there period. Some of them are in a league with fine micro-breweries here. One of my favorite beers in the world has got to La Maudite, I think its one of the most interesting & best tasting beers I've ever had. La Fin Du Monde? Its amazing. Up there with good Belgian brews that for for much more money. How can one not like Belgian beer? Only some of the best (and most expensive) stuff made? Chimay? I tried these not knowing what to expect and before I read this. I'm in the south sub. Chicago area and never heard of Unibroque but it was awesome! Some of the best beer I've ever had I'd say. Now they don't have it anymore in Orland Park, what gives? I hope I can find it somewhere else. I'm not sure where they distribute, but they're widely distributed in Portland. Glad you liked it and thanks for your comments! After trying La Fin du Monde and Maudite, the massive amount carbonation and related yeasty taste comes from the multiple fermentations and bottle conditioning. I can see how this style could be a love it or hate it type of thing. What separates Belgian beers from most other countries is the yeast strains they used giving Belgians a distinct taste. A slight sourness is often intentional in some Belgian styles. My affinity for darker ales has me preferring Maudite to La Fin du Monde, but that is more flavor preferences than a comment on quality. Still waiting to try Trois Pistoles, which I would consider the last in the "series" of blond/golden, amber/red, and dark/brown ales. Has Unibroue surpasses the 50,000 bbls capacity that characterizes the limit for micro-brewery?